Samsung launched the Galaxy Grand 2 (G7102), the company’s latest mid-range smartphone last month, which went on sale in India last week. 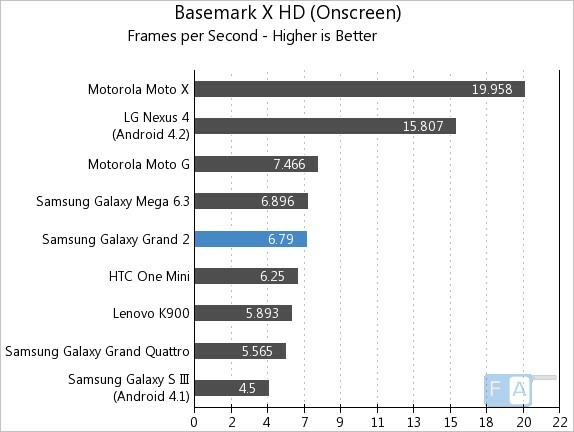 We already brought you the unboxing of the smartphone, here we have the benchmarks of the device. Samsung already confirmed that the phone is powered by a quad-core Snapdragon processor, as you can see from the CPU-Z shot above it is clear that phone has a quad-core Snapdragon 400 (MSM8226) ARM Cortex-A7 processor clocked at 1.19 GHz with Adreno 305 GPU, similar to the Motorola Moto G. Last year’s Galaxy Grand was powered by a dual-core Broadcom BCM28155 processor. 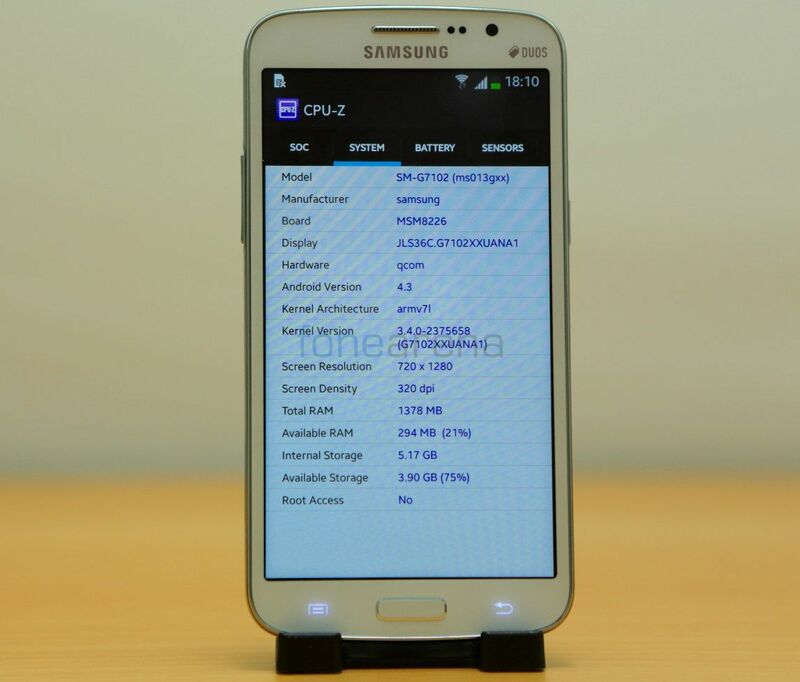 It has a 5.25-inch (1280 x 720 Pixels) display and runs on Android 4.3 (Jelly Bean) with Samsung’s own TouchWiz UI on top. 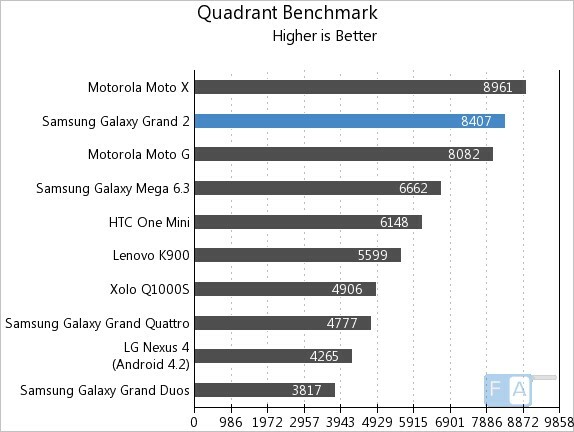 Let’s find out how the Samsung Galaxy Grand 2 performs in a range of synthetic benchmark tests. 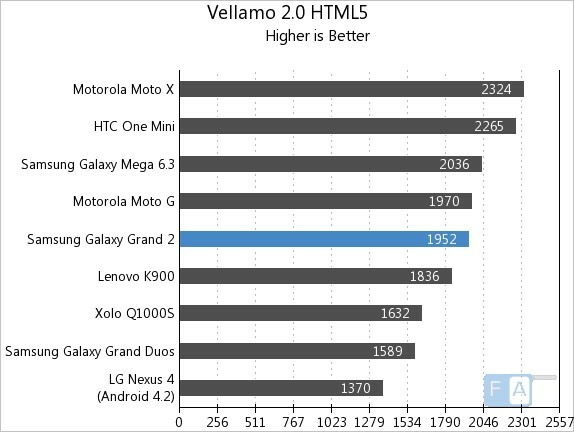 The Grand 2 is just behind the Moto G in the Quadrant benchmark. 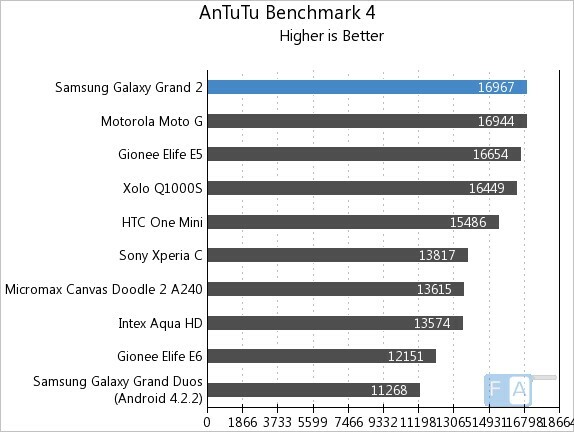 The Grand 2 tops the AnTuTu Benchmark 4 by scoring 16967 points. 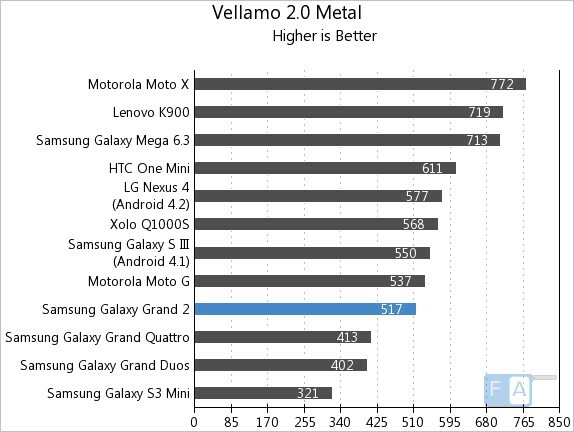 The Galaxy Grand 2 managed to score 1952 points in the Vellamo 2 HTML5 browser benchmark and lies just behind Moto G.
It managed to score 517 points in the Vellamo 2 Metal CPU subsystem performance test. 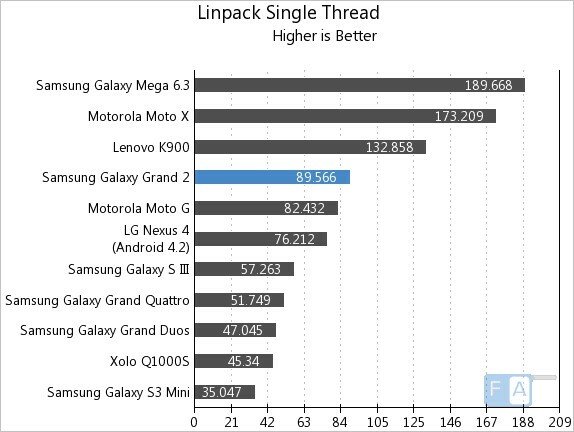 It managed to clock around 89.5 MFLOPS in the Linpack single thread benchmark. 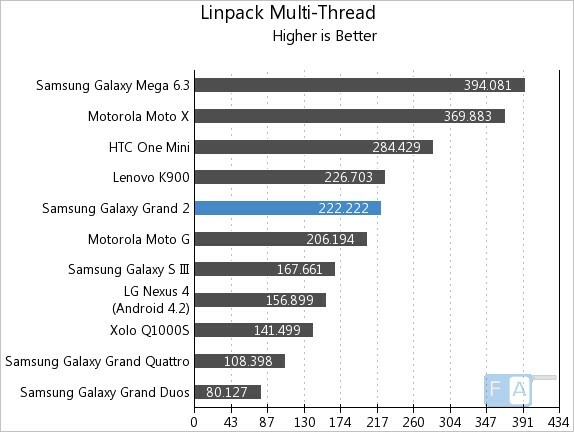 It managed to clock around 222.2 MFLOPS in the Linpack Multi-Thread benchmark. 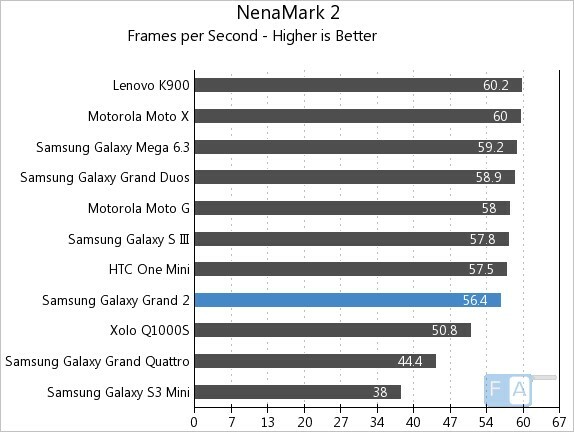 It clocked 56.4 FPS in the NenaMark 2 GPU benchmark. 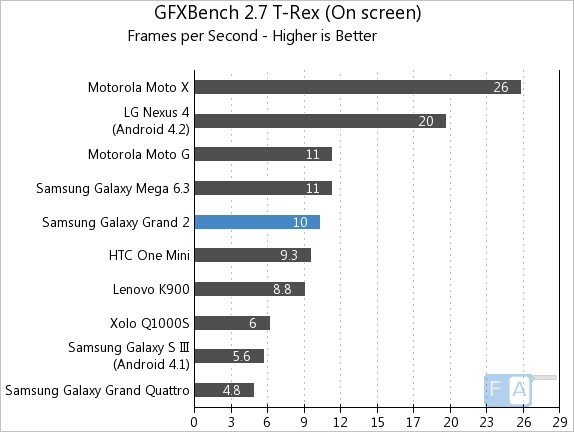 In the GFXBench 2.7 T-Rex, it clocked 10 fps, better than the One mini. 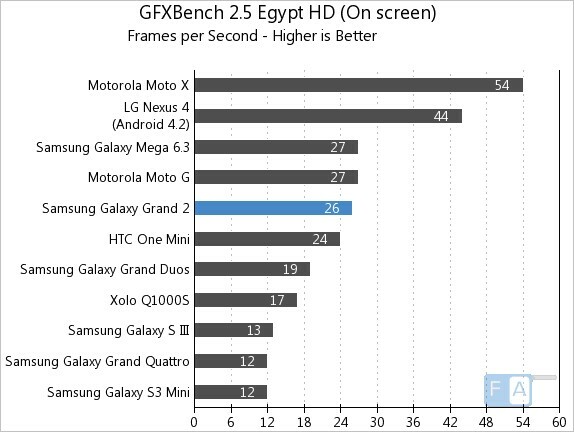 In the GFXBench 2.5 Egypt, the Grand 2 clocked 26 fps and lies behind the Mega 6.3 and the Moto G.
It managed to clock 6.79 fps in the Basemark X OnScreen benchmark. 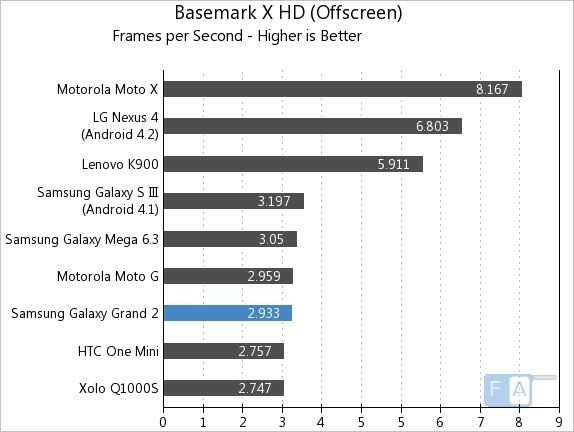 It managed to clock just 2.93 fps in the Basemark X HD Offscreen benchmark. We will bring you the complete review of the smartphone soon, in the mean time check out Grand 2 Photo Gallery.